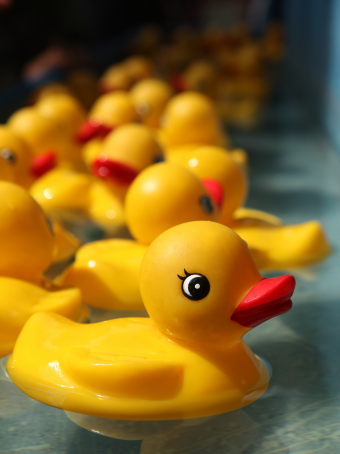 Jeremy W. asks: How did rubber duckies for bathtime become a thing? In 1970, everyone’s favorite orange roommate sang a song to his bathtime buddy. “Oh, rubber duckie, you’re the one. You make bathtime lots of fun,” cooed Ernie to his squeaky yellow friend. While the rubber duckie had been around for at least a century prior to Ernie and his mellow melody, this Sesame Street tune shoved the bathtime toy into the popular culture lexicon where it has remained ever since. From a chew toy to a piece of art to Ernie’s best friend (sorry, Bert), here’s the story of how the world got into the bath with the rubber duckie. In 1839, Charles Goodyear discovered vulcanized rubber. Legend has it that while in an argument with his lab partner, he angrily threw a piece of sulfur-covered rubber into a potbelly stove. The rubber charred and, then, hardened. Heat had combined the sulfur molecules to the rubber molecules, creating a rubbery substance that was stronger and more elastic. Whether that’s really how it happened or not, Goodyear never reaped the financial rewards that often come with an invention of this magnitude. In fact, he died $200,000 in debt, or about $5 million today. (See: The Luckless Rubber Maven: Charles Goodyear) Nevertheless, the vulcanization process and his subsequent patents changed the world. By the mid-1800s, products using vulcanized rubber started flooding the market, including footwear, sheet rubber, car springs, bicycle tires and toys. The first vulcanized rubber toys were available to consumers around 1850, which included balls, rattles and doll heads. It isn’t definitively known who was the first to make a duck-shaped rubber toy, but the first rubber squeaky toy of any type was invented around the 1860s and the first rubber duck decoy (which was used for hunting) came in the 1880s. Rubber toys at this time were nothing like we think of today. Hard, unattractive and not malleable, they were often used as chew toys for teething babies and dogs. Like these toys, the early rubber duckie play item was not meant as a water toy. As noted by toy scholar, Charles Steiner, it “was cast, solid and did not float well.” It also was most certainly not bright yellow. Whether you hold to Wos’ speculative theory or not, it isn’t difficult to see how a toy duck, whether it floated or not, would inspire kids to start playing with it in the bathtub, regardless of how dirty the water purportedly was. Nevertheless, it would be several decades after this era before rubber duckies would hit the mainstream. One of the first relatively popular rubber duck toys came about in 1938 when the Seiberling Latex Products Company partnered with the newly popular movie studio Disney (who had just released to great fanfare Snow White and the Seven Dwarfs a year earlier), debuting a line of rubber figurines, including their character Donald Duck. Made from solid rubber, like incarnations before it, this rubber duck was not meant for water play. 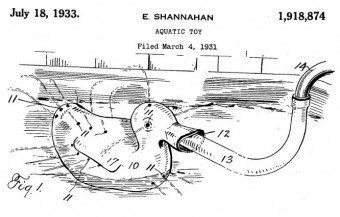 A few years prior to Disney’s Donald Duck toy, a patent was filed by Eleanor Shannahan of Easton, Maryland for what is generally considered the first true rubber duck-shaped bath toy. While this rubber duckie wasn’t like today’s version, it provided amusement nonetheless to “both little children and older persons” by shooting jets of water at unsuspecting bathers. 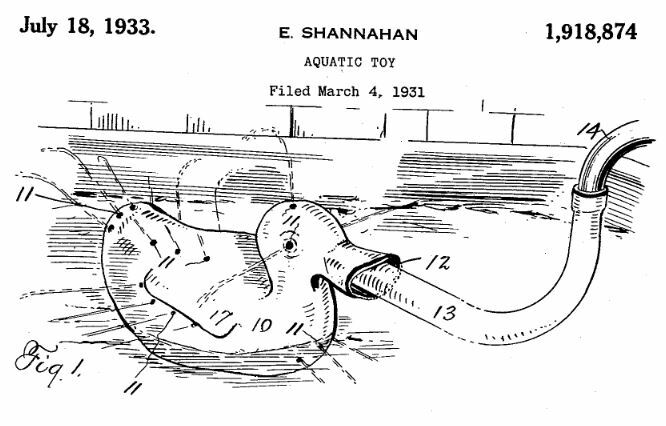 As the patent reads, the duck toy was supposed to “to produce an attractive fountain-like effect, and also to enable the playing of pranks by one person upon another.” Little is known about the actual production and sale of this item, but, in 1941, a Los Angeles artist and sculptor took this basic design and turned it into a fortune. Even before his creation of the iconic yellow rubber duckie, Hollywood artist Peter Ganine was rather famous. Immigrating from Russia to the United States on an art scholarship, he moved to Los Angeles in the 1930s where his work attracted the attention of longtime Los Angeles Times art critic Arthur Millier, who helped expose him to the greater art community. Ganine hit his apex in the late 1940s when he began designing toy sculptures, like a giant grinning whale and a bright yellow rubber duckie. 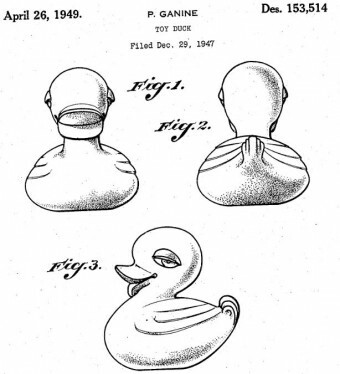 Patenting it in 1949, the patent document for the “toy duck” was remarkably short and to the point with the drawings of his design doing most of the talking – showing that it floated, squeaked, possessed a goofy smile and it was yellow. The design was a hit and Ganine sold millions of his yellow rubber duckies. While Ganine later also became famous for adding Gothic faces to chess pieces, the duck became his most defining work. Over the next decades, the rubber duckie became synonymous with kids’ bath time, with a major assist from Ernie’s song. Debuting in 1970, “Rubber Duckie” was so beloved that it actually landed on the Billboard charts, reaching as high as number 11 in 1971. Written by Sesame Street head writer Jeff Moss and voiced by legend Jim Henson, the song became one of the show’s defining moments, even reenacted by Little Richard in the 1990s. Since then, the rubber duckie has had several other pop culture moments, like when 28,000 of them were accidentally dumped into the ocean during a storm (to this day, there are still reports of people finding them around the world). 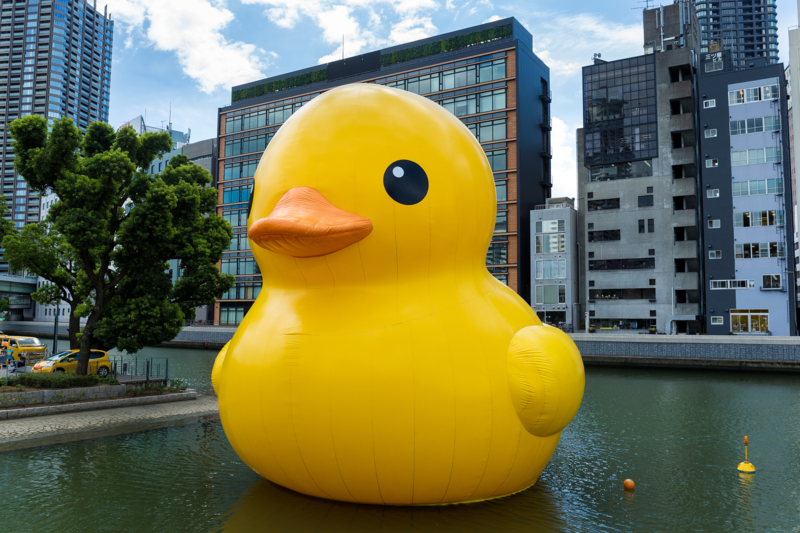 There’s also been several occurrences of a giant yellow inflatable duck making appearances in major cities, including stops in Hong Kong, New York and Syracuse. And so it is that for over a century now rubber ducks, in one form or another, have joined us for bathtime. Presumably the now iconic yellow duckie will continue to be a mainstay for centuries more. After all, they are kind of fun to play with while taking a soak. What Happened to Huey, Dewey, and Louie’s Parents?